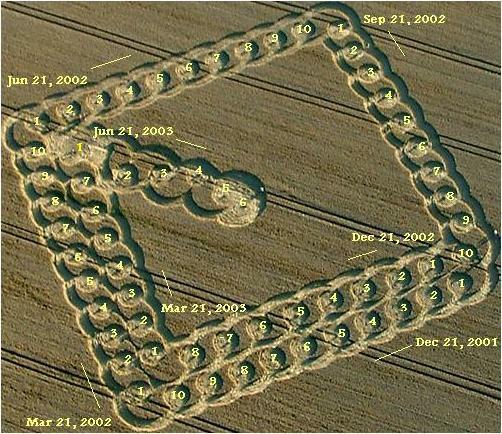 Remember the 2002 crop circle that showed 4 celestial bodies in a row? People were relating this to the eclipse of May 16 as further proof that this was the date of rotation stoppage. What if this was part of the little joke that the Zetas played on NASA? Which was why they emphasized May 15 from the outset. But what if this was a double entendre and the real eclipse was the next one, the total solar eclipse of November 23-24, 2003, best viewing from (you got it) Antarctica and Southern Australia! But does this make any sense? Well, remember that we both thought that the Eastfield crop circle was related to the solstices/equinoxes? Well, what if you count days not from when the crop circle appeared but from the next solstice of equinox? Sure enough, Sept. 21 (fall equinox) plus 61 days takes us to a pole shift on Nov. 21, 2003. If each edge of the crop circle reflects a quarter of a year (about 91 days) then each of the ten circles along each outer edge could be seen to represent about 9 days. I've long wondered why there is a turn inward to a line of 8, one of 7, and then a very hectic inward line of 6 circles at the end. If these groups are all counted as 9 days, then (8 + 7 + 6) * 9 = 189 days. But what can this mean? Well, counting backwards 189 days from Nov. 21, 2003 just happens to take us to May 16, 2003!